Since I baked Eggless Linzer Cookies and Eggless Coca-cola Brownies last Christmas, there has not been a homemade baked goodie kicking around our kitchen. This weekend, I got inspired by one of the gorgeous cake images on Pinterest and itching to try out my new bakeware from Masterclass. 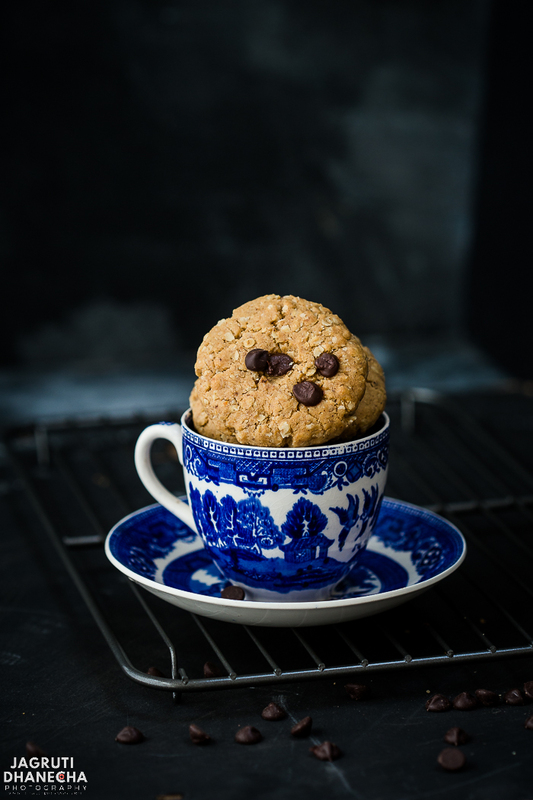 I tasked myself with baking these Vegan Chocolate, Peanut and Oats Cookies! 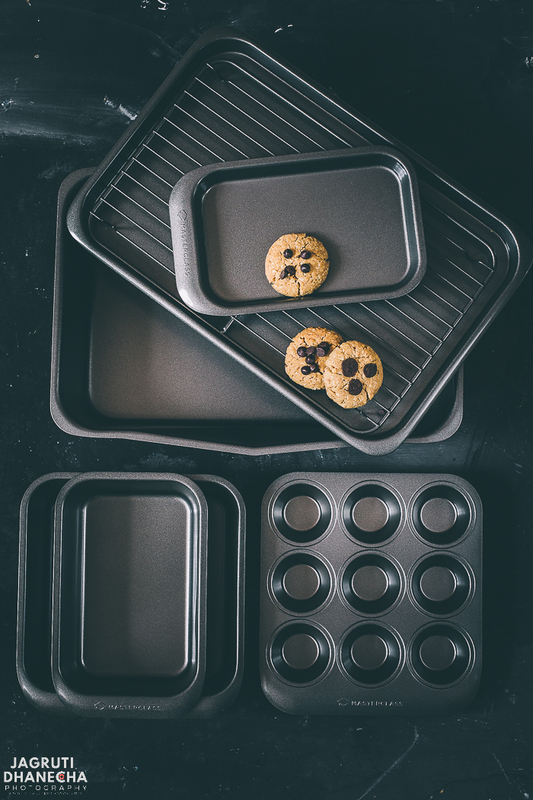 When folks from award-winning bake and cookware brand Masterclassuk asked me if I can review their 7 PIECE STACKING NON-STICK BAKEWARE SET, I took the challenge with both hands. This set just came at the right time, as we are renovating the house and was thinking about getting rid of old, miss match and tacky baking trays and tins. Currently, I have an assortment of baking pans and tins and occupying a lot of space, yes even double oven is not enough to keep them and hubby was raising his eyebrows whenever he saw them toppling each other. So I boxed them away! I discovered that this masterclass durable 7 pieces non-stick bakeware set is much better suited for my kitchen. I had never bought a 'complete set' before which is stackable, so this is very convenient as it is all in one set. The set came in a beautiful and luxurious black box, this makes the perfect gift for a newly wedded couple, house warming party or a someone who is a complete beginner and is eager to get stuck into the amazing world of baking. Non-stick roasting tray: 41 x 31 x 9.5cm. Small non-stick oven tray: 24 x 15 x 2.5cm. Large non-stick oven tray: 40 x 27 x 2.5cm. Non-stick 9-hole muffin tray: 24 x 22 x 3.5cm. Non-stick wire cooling rack: 35 x 22 x 2cm. Non-stick square cake tin: 24 x 22 x 6cm . Non-stick 2lb loaf tin: 4.5 x 15 x 6cm. 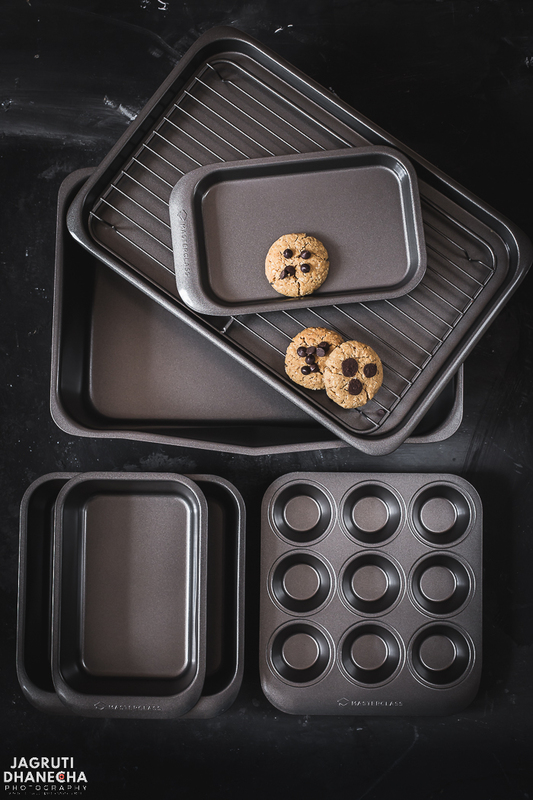 Each piece is made with heavy gauge carbon steel which is renowned in the baking world for its strength, durability, and even heat distribution for consistent bakes with a 100 % BPA free durable non-stick coating, which means you can easily remove baked items from this bakeware, and it is easy in cleaning and can be used daily without any worries. They have a nice weight to them, also these bakeware have extended handles at the front for easy carrying and the roaster has a large pouring lip as a bonus to remove juices and excess fat. The entire set nests into the largest tin, taking up 41 x 31 x 9½ cm of room in cupboards and drawers. This bakeware set is completely dishwasher safe and comes with a 20-year guarantee. Total peace of mind, BRB I am off to bake another batch of these delectable cookies! 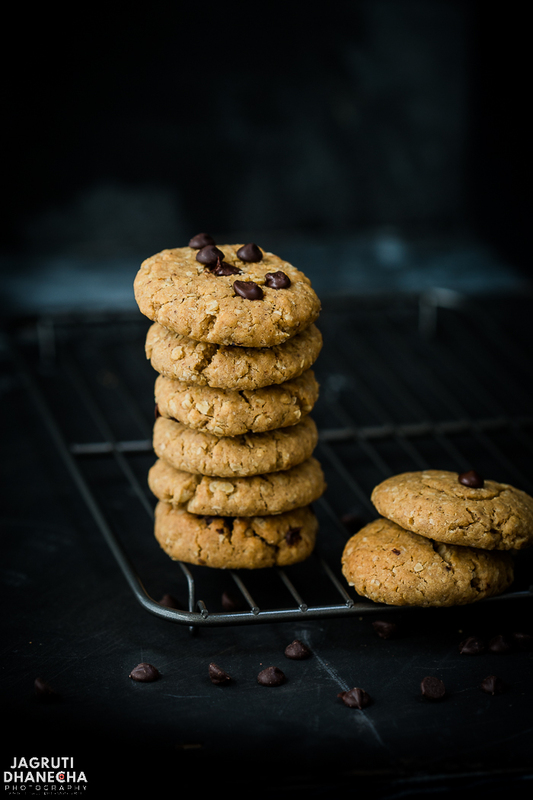 HOW TO MAKE VEGAN CHOCOLATE, PEANUT AND OATS COOKIES? First, combine all the dry ingredients - Plain flour, rolled oats, salt, cinnamon and baking powder, and baking soda. In a bowl beat oil, peanut butter, vanilla extract, milk, flaxseed powder and sugar. ( White granulated and dark brown or coconut sugar) until smooth. Fold in the dry mix little by little and add chocolate chips. Spoon about 2 TBSP of cookie dough on the baking tray, spacing about 2" apart and flatten slightly. Bake for 12-15 minutes until the edges goes brown slightly. Remove it from the oven, let it cool slightly on a baking sheet then remove on a cooling rack. Just look at how delicious they are! Believe me when I say these will get eaten up fast, they are especially tasty warm right out of the oven. 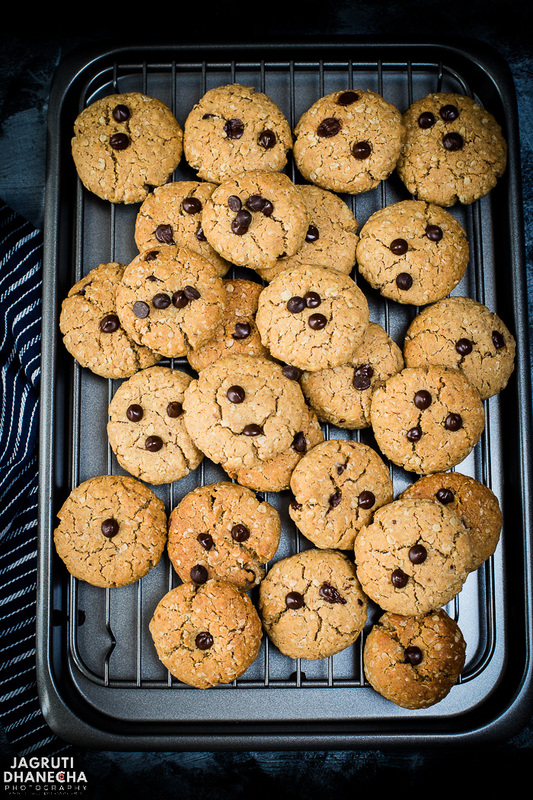 The recipe of these vegan chocolate, peanut and oats cookies is really easy and quick to make. Crispy outside and chewy inside and just right for those sweet cravings! Preheat oven to gas mark 4 or 350F. Line two baking tray with parchment paper and leave it aside. In a bowl combine dry ingredients such as flour, oats, salt, baking powder and baking soda and chocolate chips. In a big bowl place peanut butter, oil, vanilla, sugar and milk and beat until smooth ( it will take 2-3 minutes. Now fold in dry mix little by little into the wet mix with a spatula. Using spoon or ice cream scoop form cookie balls on the baking tray. Press slightly and bake for 12-15 minutes or until edges start getting brown. Once done remove from the oven, let it cool for 5 minutes. Then let it cool completely on a wire rack. If you want to make eggless cookies then use normal dairy milk and butter instead of plant-based milk and oil. Milk chocolate or white chocolate chips can be used for a normal cookie recipe. Want to make gluten-free cookies? use gluten free flour and oats. Disclaimer- I was sent the MASTERCLASS 7 PIECE BAKEWARE SET for an unbiased review and not told or paid to write anything positive. All thoughts and opinions are my own. Thank you MASTERCLASSUK team. Jagruti, I love the fact that the cookies are eggless and that you have added flax seeds too. The cookies look simply scrumptious! 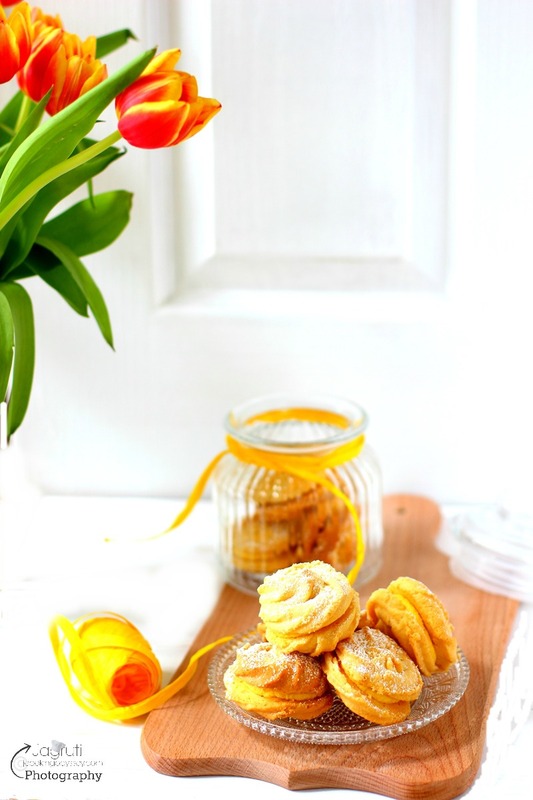 Perfectly baked cookies with a lovely texture.Nutritious with all the healthy ingredients and these look so delicious!! Yummy, haven't baked cookies in a long time. These cookies are so tempting and am sure each bite has a chocolate chip. Love these vegan cookies and a great choice of flours. Love the texture of oatmeal cookies and that with peanut butter and chocolate chip will be so amazing! These cookies look delicious! I love all of those beautiful chocolate chips! First, that baking set is AMAZING!!! It's a dream come true for any cook really. And these cookies.. oh my... these are perfect! Love the texture and the fact that they are vegan. Giving them a try next week. This vegan chocolate peanut oats cookies looks yum. My kids will love it as it has chocolate chip in it.